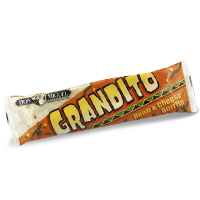 Dig into 10 ounces of velvety cooked beans and real melted cheese with the GRANDITO® Bean & Cheese Burrito. 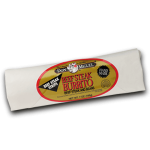 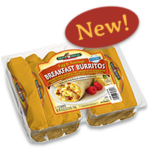 This classic combination is far from ordinary, offering up lots of flavor in each hand-rolled, handmade flour tortilla. 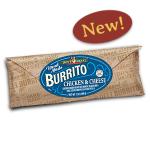 Find it at your local convenience store or grocery freezer today, along with your other DON MIGUEL® Brand favorites. 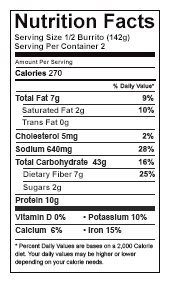 Cooked beans (water, beans), water, pasteurized process American cheese (American cheeses [milk, cheese culture, salt, enzymes], water, milkfat, sodium citrate, salt, sodium phosphates, color [annatto and apocarotenal]), modified food starch, green chiles, contains 2% or less of: distilled vinegar, green bell peppers, oats, salt, spices, dehydrated onion, paprika, guar gum, dehydrated garlic, red chile peppers, red bell peppers, citric acid, crushed red pepper.